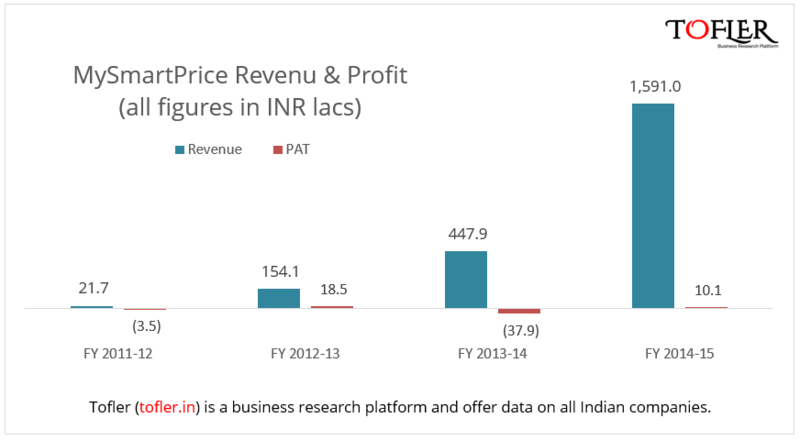 MySmartPrice, which offers an online price comparison platform and recently raised $10 million from Accel and Helion, has reported a revenue of INR 16 crores in FY 14-15. The company is still in its early years and registered a growth of 255% over the previous fiscal. MySmartPrice is owned and operated by MySmartPrice Web Technology Private Limited. It was founded by Sitakanta Ray and Sulakshan Kumar in 2011. It offers an online price comparison engine which enables the users to find prices as well as deals and offers from all major e-commerce stores in India. The site claims to be used by 4 million users every month across India. The company had raised INR 63 crores funding (INR 50 crores from Accel Partners and INR 13 crores from Helion Venture) in June 2015. Around 80% of the revenue for the company comes in the form of affiliate income (commission from promoting affiliate products on the site) and 18% comes in from advertising and online directory services. The major expenses include employee expense (48%) and advertising and marketing expense (23%). Multiple online ecommerce stores operate in the country and discounts galore, websites like MySmartPrice offer an easier way to access the products and discounts across various platforms. Their competitors include Junglee, Pricejugaad, Compareraja, BuySmaart, Shop Pirate, Buyhatke, Smartprix, Pricedekho among others. With their model shifting from price comparison across online platforms to including local retailers to list prices of their products, a new space seems to be emerging which would be something to watch out for. Author– Vishal, a Sci-fi enthusiast, engineer by mistake and writer by choice, combines his eye for numbers with natural flair for storytelling to churn out Tofler’s blogs.